The MSC Virtuosa is one of the two largest ships in her fleet alongside the MSC Grandiosa. The ship offer guests a hi-tech and stress free experience thanks to the expansion of MSC for Me as well Zoe, your digital cruise assistant onboard. 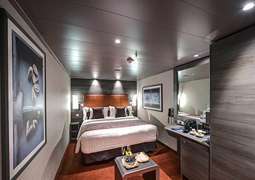 As with all MSC ships, guests can expect a variety of elegant cabins from interior rooms to the Yacht Club Royal Suite. The Virtuoso boasts the highest proportion of ocean view cabins, as well as plenty of choice for families and duplex suites with a private whirlpool bath. The MSC Virtuoso boasts world leading, exclusive entertainment options which can be enjoyed in various venues. Thanks to an exclusive partnership with Cirque du Soleil at Sea, passengers can enjoy the opportunity to see a unique, world leading show twice a day, six nights a week. The MSC Yacht Club offers an exclusive, luxury cruise experience. You will get access to an exclusive area of the ship with 24 hour butler service, private concierge, luxurious suites, and all inclusive fine food and wines. 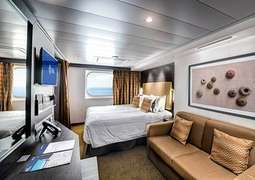 The MSC Virtuosa offers a wide range of cabins types including family rooms, extravagant suites, and the highest ratio of ocean view cabins on any cruise ship. 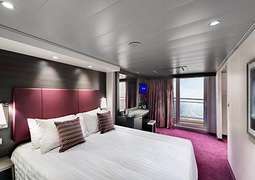 One of the highlight's of the ship is the MSC Yacht Club Royal Suite. This elegant suite includes a separate living room and a large 70m² balcony with a private Jacuzzi. The Cabins for Families make it easy to cruise with your loved one. The cabins are created by combining up to three connected cabins and sleep up to 10 people. They also come with a number extras including priority choice of seating at dinner and activities for children to make your tine on board as stress free as possible. MSC is well known for its freshly prepared and every changing Mediterranean and international menu prepared by expert chefs. As well as the buffet option, the MSC Virtuosa is home to a number specialty fine dining restaurants where you can enjoy a more formal setting and dishes created around your specific wishes. Whether you need an express lunch, kosher, vegetarian or vegan, or just a Sommelier’s er's Suggestion for which wine goes best with your meal, these restaurants can cater for you. If you're celebrating an extra special occasion at sea, you may want to consider the MSC Yacht Club. Here you will enjoy all inclusive luxury dining including access to a private dining area, exclusive delicacies, and a fine wine service. MSC is well known for it's on board entertainment. In the day time you will be able to enjoy the embankment celebration "Sailaway Party", MasterChef At Sea and various sports tournaments. There are of course also a host of activities for the nights owl. Officers & Gentlemen is a traditional maritime dance harking back to a more glamorous age. Why not watch or even compete in the MSC Factor? Or if you're feeling lucky, head to the casino to play Black Jack, Roulette and Poker amongst others. MSC also offer an array of entertainment and venues for children and young adults including Virtual World, Aqua Parl and Kids Corner. MSC is proud to be the only cruise company offering authentic Balinese spas with a huge selection of beauty and health treatments. Treatments available include Mya Advance, Shu Uemura, and aromatherapy treatments. There are also various indoor and outdoor fitness and sports activities. The state of the art sports centre offer cutting edge gym equipment as well as personal trainers and classes. Outside you'll find a jogging track, football pitch, tennis courts and more.